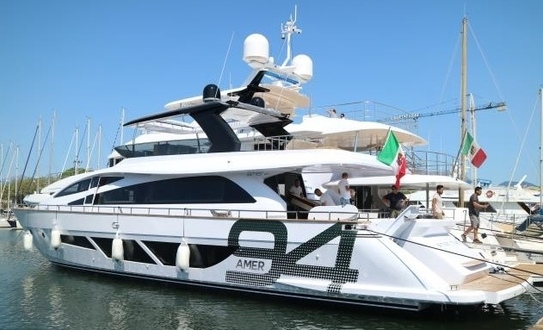 Amerio’s Family is happy to announce the launch of the new Amer 94 Twin, a super yacht under thirty meters which embodies the Italian yacht builder pioneering philosophy regarding consumption and emissions. The new Amer 94 Twin is the first super yacht adopting the Volvo 1000hp configured to the new IPS1350 in double propulsion configuration. The 94 Twin is for customers who enjoy life on board in large open and indoor spaces, and high comfort for long range and stabilized slow cruising. The Amer 94 Twin preliminary data is equally impressive with best in class fuel consumption of fourteen liter per mile at a fast cruise of 23 knots, while an economic 9 knots gives you a range of 1600 nautical miles. The Amer 94 Twin was certified by Rina Green Plus in order to emphasize the research process for new solutions, technologies and environmental friendly material used for the construction. The first Amer 94 Twin which is recognizable from the standard model by the new large hull side windows was furnished in to a classical timeless style, with natural and white lacquered teak mixed with original custom details like a twin double galley.